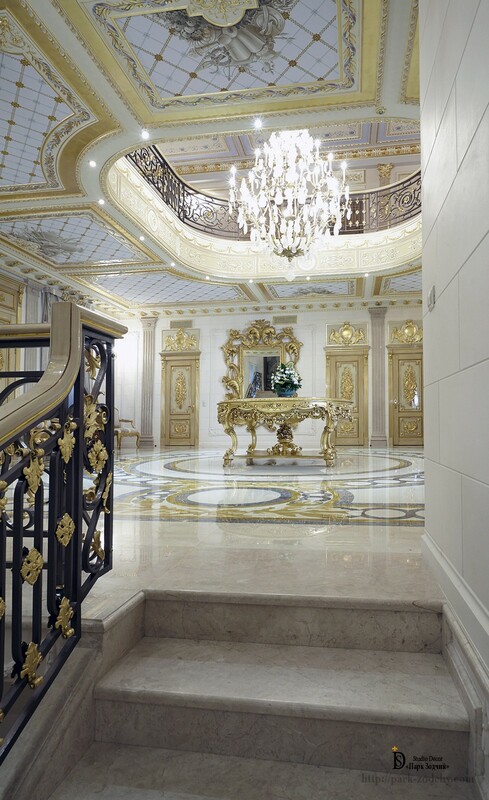 The Empire style has become logical continuation of Classicism. 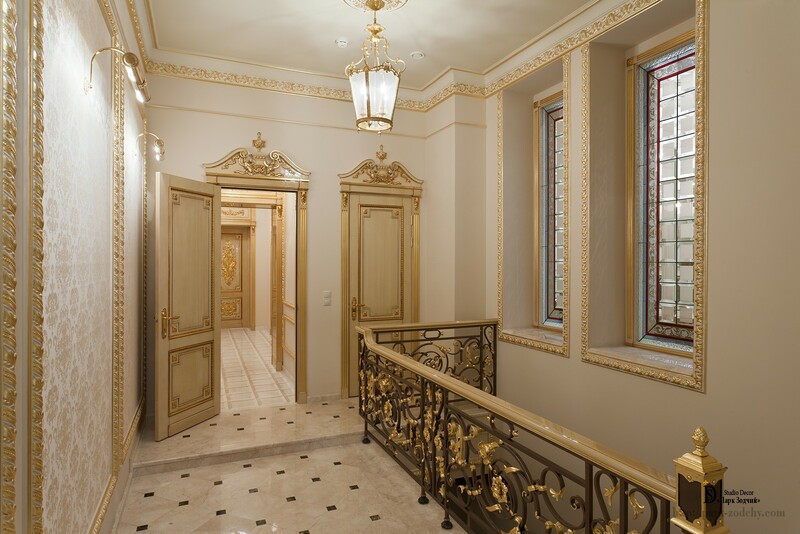 Having absorbed the basic principles of decoration, including simple-form stucco moldings, wall mural paintings and other components, it has acquired the character traits. Which ones and why? This style can be considered eclectic in its own, as expeditions of the Napoleon’s Army were marked with conquest of large territories and countries. Works of art, décor items and furniture created by artisans from different countries began streaming to France. As a result, houses of the noblemen ceased to be conservative; they do not hold strict features of one style or décor of specific theme anymore. Combination of various styles and trends, including Trompe l’oeil mural painting became the hallmark of that era. 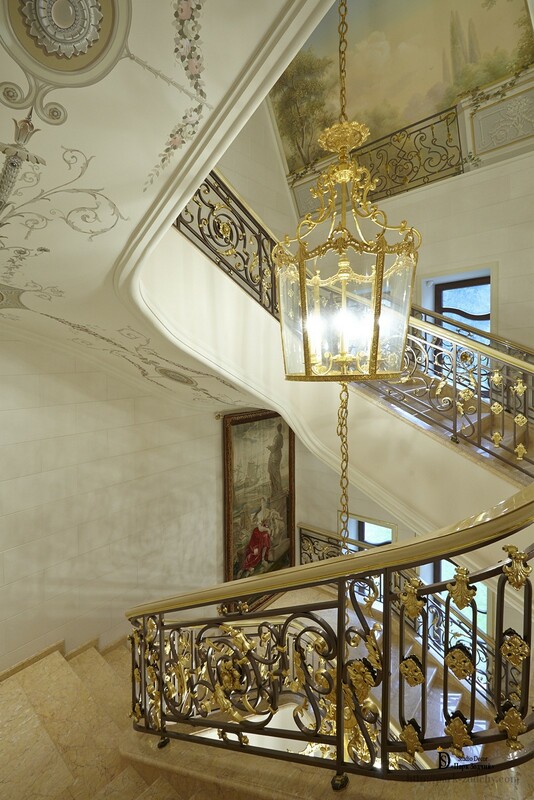 As a result, this style became the most convenient way to create interiors of homes that become historic mansions. Not only décor is interesting in this project, but in a greater degree is interesting the history of creation of the Interior design. The customer wished to create a family manor not only for himself, but also their descendants. Why? The question is not idle. It’s worth remembering the period of the Soviet Union when not just noble, merchant dynasties were destroyed, but all that could contain the word “ancestors”. Regularly replaced furniture and more modern interior items forced to throw out exclusive chests and whatnots, exquisite lamps and unrenderable beautiful candlesticks. Artistic parquet was replaced with ordinary carpet or linoleum. We can continue for a long time. But generic ties were lost. It is the vicious circle that has been broken by decorating country home. 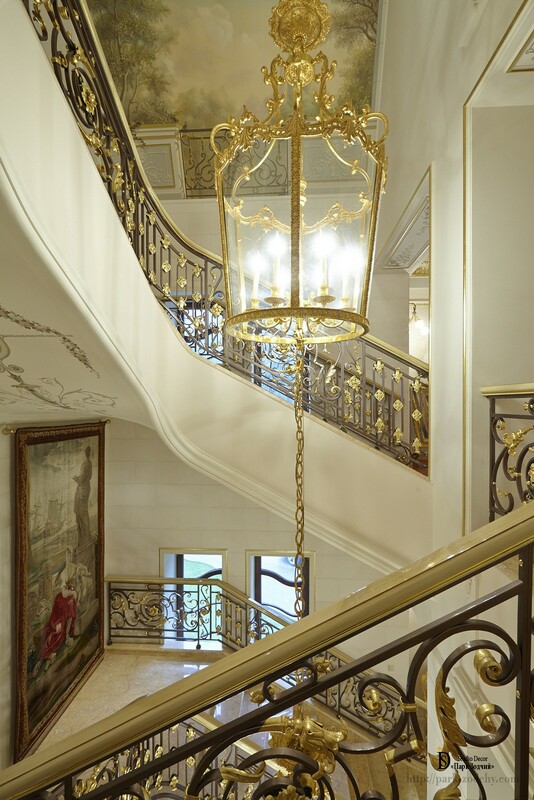 One of the iconic elements is the staircase that has united not only the different floors of the house, but also stylistic techniques: gilding in the Interior made it elegant, the painting has become an iconic element of décor, the murals have made the necessary accents. In the past, people also have tried to preserve the family nest that kept family heirlooms, confirmation of success of the ancestors. The history of the USSR, when all were not just equal, but must be equal to each other, unfortunately has not been still over mentally, therefore motivates successful people to acquire property in other countries, including in London. In this country, private property is treated respectfully. There are no revolutionaries here, who want to select and divide everything. Customer’s wishes to create a luxurious family nest, which has gathered, and will gather not only works of art and antique items, but also the nearest and dearest people, have been complied with. This Interior has gathered the traditions of the past, so that they would become a bridge between today and tomorrow.